I saw on the news tonight about a large storm cell going all the way from texas to the northeast of the US. Freezing rain and snow. We're supposed to get 1-3 inches tonight and 6-12 inches tomorrow. x_x Anyone else getting hit with this storm? 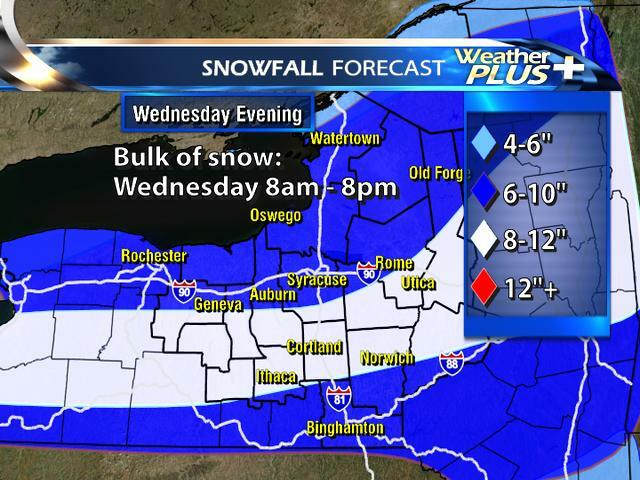 I wish I lived in Syracuse or up state NY ... so beautiful in the snowz. We got about 1 inch at our house last night, 6-10 starting now until 7pm and then another 2-5 inches overnight and then another 1-3 tomorrow morning. wtf. My opinion, not meant to offend. I don't think it's that bad, I walk everday even when it was in single digits. Kinda pissed its messy out today but still glad I went for walk. This is the first winter I didnt let it control me and keep me inside. I feel great and feel this winter is pretty mild. Sure the last few were easy winters but this is till better than 3-5 winters ago, where we had high temps of zero for 3 weeks in a row. And though it may piss ppl off I dont mean too. I think the constant above then below normal temps all year are more of a sign of climate change than a tough winter. Come on this planet has had ice ages, were we to blame for that too. I know my view might anger some but remember, intelligent conversation allows any well thought out view. Sorry, dont get me wrong I hate winter but this one is still kinda mild for NY. All I can say is don't let it control you. We got about a 1/2 ice down here in Dallas, some places worse than others. Took me 20 minutes to chip it off my truck, even though i had had the heater running hot. Not the worse I've driven in, but the biggest problem is most people down here don't know how to drive in bad conditions. Honestly, the only reason I know is that the year I learned to drive, my hometown got caught in a 3 day blizzard, after which my dad made me take the car out and we drove all around town, so I learned pretty quick. I watched this movie on netflix the other day. It was surprisingly entertaining to me. Its filmed like the Blair Witch Project, but instead of the woods and a witch, its on a snow covered mountain with a couple demons. The trailer is spoilerish so don't watch it if you'll be watching this movie soon or it'll be too fresh in your memory and certain scenes will loose the surprise factor. The camera work was much better than The Blair Witch Project and Cloverfield, thanks to bipods and plenty of stationary shots. Aside from the camera having a bit too frequent electronic interference issues for the last half of the movie and few too dark scenes, this was a decent movie to watch. I heard these articles a couple years ago and I mostly forgot about it, but after thinking about it again the other day I figured I'd post a topic about this. The first article is in 2 parts and its basically about how sea level rise is going to make an island nation non-existent in the future because of the amount of land they are loosing over time. But its also about how the people living there have faith in their religion that their land will be saved. I don't really see it working out too good for these people. The second article is about another island nation loosing land based on erosion due to dieing off coral reefs. Both are interesting reads. After looking at these two articles I noticed the comments are filled with the constant political argument of Global Warming being a hoax. Fox News of course is the largest organization pushing the hoax opinion and its obvious their fanbase loves to spread their message. Regardless of the comments in the article, I think its a combination of sea level rise along with erosion and most likely improper treatment of beach front land that is causing these large issues. The US and many other countries fight off beach erosion by rebuilding beaches with sand pumping and building new reefs to help break waves along the coastlines. But for these small islands they don't have the resources to repair erosion, fix inundated land or repair reefs. There could the be case that the islands are sinking, but that wouldn't cause the islands to be under water in a mere 50 years. With all the factors involved, sea level rise does appear to be making a lot of the land uninhabitable. With these facts most of the people living on these islands don't think anything bad is going to happen at all and often make jokes about climate change. Even with their own government issuing warnings about the changes happening to their islands and that moving to Australia may be a complete reality within half a century many of their citizens believe that God will not let anything happen to the islands and that everyone else is completely wrong. I can understand having faith.. but being ignorant of facts could really screw over these island communities. We're getting 12-18 inches within the next 12 hours and thats not counting the 4 inches that snowed overnight. Anyone else getting snowed on today?